The all-new Toyota Camry was designed to turn heads and engineered to change minds. The new Camry has an agile and dynamic exterior. The Toyota Camry’s interior has been designed to provide an environment where the driver can relax and completely focus on the road ahead. Everything inside the Camry was specifically chosen and molded to heighten the overall driving experience for the driver and passengers. With its improved handling, it offers a responsive drive that allows you to enjoy both twisty roads and tricky urban conditions. Though exciting to drive, the Camry is always committed to safety. Inside you’ll find confidence-inspiring safety features to keep you protected at all times. What’s New on the 2019 Camry? For years, the Toyota Camry has been praised as an excellent ride filled with countless features and more. So, why would the 2019 Camry be any different? Always dependable, stylish, and a ride you can count on, the Camry offers a cozy ride for you and your passengers. The 2019 model is offered in five separate trim levels: L, LE, SE, XSE, and XLE. The base L trim offers 16-inch steel wheel, automatic LED headlights, cloth upholstery, a Wi-Fi hotspot, a rearview camera, keyless entry, a USB port, a six-speaker sound system, and more while the LE trim provides 17-inch alloy wheels, a car alarm, a 60/40-split folding back seat. The SE offers 18-inch wheels, a sport-tuned suspension, paddle shifters, and more. Finally, the XLE and XSE trim levels offer a range of features such as dual-zone automatic climate control, leather upholstery, blind-spot monitoring, keyless ignition, wireless smartphone charging, a head-up display, and more. As you can see, there’s plenty to offer with the 2019 Toyota Camry. Formerly designed to be a compact size vehicle, the Toyota Camry has undergone countless adjustments throughout its 24 years of existence. Having a respected past for dependability more so than looks, in 2007 Toyota debuted a completely redesigned model that was bolder than ever before. A perfect mix between chic and daring, the new and improved Toyota Camry next become available with a 3.5 liter V6 for those looking for a bit more power under the hood. Another milestone of the Camry’s history is that it is now offered as a hybrid, making driving experiences better for the driver and greener for the environment. Due to all these ground-breaking modifications and more, it has led the Camry to become an award-winning mid-size sedan of its class. Our Toyota dealership, in Birmingham, AL, has built long relationships with clients all over Central Alabama for the past 27 years and still continues to do so. Whether you’re looking to buy a new or used Toyota Camry in Birmingham, need service on the one you already drive, or want to discuss financing options, our friendly staff will be more than happy to guide you through the process. 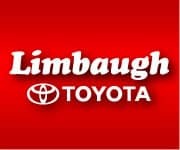 If you want first-class customer service and a stress-free atmosphere, choose Limbaugh Toyota for all your automotive needs.